DUBOIS COUNTY -- Two girls lay motionless near an overturned four-wheeler while three teens sat in a nearby car apparently unconscious or hurt. “We’re going,” someone among the members of the Dubois Volunteer Fire Department said and the first responders walked into the scene. The level of professionalism was apparent as they immediately took over the scene staged in the parking lot of the Northeast Dubois High School parking lot. 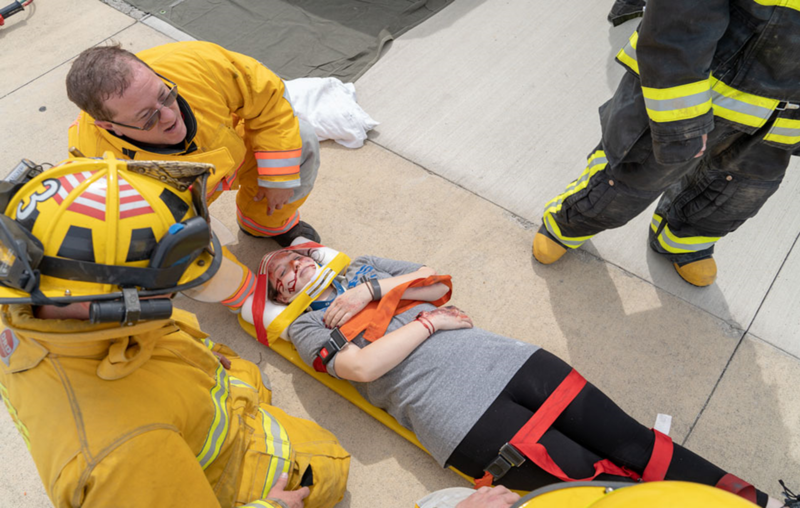 The drill wasn’t really for the benefit of the first responders who were efficiently handling the injured and intoxicated actors — although they surely gained a bit of experience from it. It was for the audience of Northeast Dubois High School seniors and juniors sitting on the lawn adjacent to the parking lot. Taking months to plan by the Dubois County Sheriff’s Office, School Resource Officer Tim Lampert hoped the event would give them a comprehensive look at the potential impact of distracted or intoxicated driving a few days before they would be celebrating prom. In the scenario, Northeast Dubois Senior A.J. Kirchoff played an intoxicated operator of a four-wheeler involved in a crash with the Pontiac Grand Am. The Grand Am being driven by Jackson Brosmer then swerves and ends up off the road in a ditch entrapping he and a passenger in the back played by Logan Dodd. As the scene plays out in front of the students, the St. Vincent Stat Flight swooped over their heads and landed in the nearby field ready to transport a victim to the hospital. Meanwhile a conservation officer began administering a field sobriety test to the driver of the four-wheeler. The student is wearing a special set of goggles simulating her impairment if she had a blood alcohol content of .17 percent. She is soon placed in handcuffs by a female deputy and ceremoniously walked away. Loaded up with its patient, the helicopter takes off and leaves while back at the car, the fire department is ripping the rear driver’s side door open. The remaining two occupants are covered in blankets to protect them from the flying glass from the shattered windows. The scenario comes together well as many of those responding have dealt with the real repercussions of actual crashes around the county over their careers. After the scenario ended, the students heard brief talks from conservation officers, police officers, probation officers, drug counselors and others on the lasting impact of their decisions. The hope today is that it makes the repercussions of their decisions real in the minds of the students. And for some, it did. “I don’t think I’ll even change the radio station while driving,” Brooklyn Dodd said about the impact the scene had on her. Her cousin, Logan Dodd, played the injured passenger in the back of the car. Logan admitted being in the back seat of the car and hearing the firefighters and their equipment working on the car as the glass fell on his covered face was shocking. We knew it was fake but it was intense,” said junior Chloe Terwiske who was the front seat passenger in the car. Being covered up by the blankets, both teens admitted it was weird and terrifying waiting and listening as the first responders worked to remove them. The drill included members of the following county services: Dubois Fire Department, Haysville Fire Department, Celestine Fire Department, Memorial Hospital Emergency Medical Services, Stat Flight, Dubois County Sheriff’s Office, Indiana Conservation Officers, Prosecutor, Probation and Courts from Dubois County, Counselors and other school staff.